Luis Hamilton – Auto Amazing USA! Original good condition. No subscription labels. This copy has been read and flipped through. No major issues, bends or tears. Photo depicts actual item. Jimmie Johnson — Is NASCAR’s Alpha Dog Human? Career Dilemma for F1’s Fastest Driver. Can McLaren Give Hamilton a World Beater? 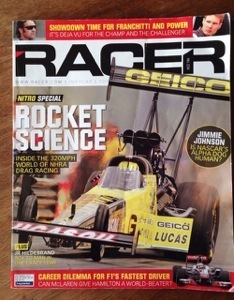 Racer is a monthly, U.S.-based motorsports magazine. It has news and feature articles relating to most of the world’s major auto racing series, including NASCAR, Formula 1, the IndyCar Series, Champ Car, the American Le Mans Series, the Grand-Am Rolex Sports Car Series, NHRA Drag Racing, and the World Rally Championship, as well as grassroots racing categories and feeder series. The magazine is known for its photography, such as the photographs used in the features, which take up-close, top to bottom looks at top race vehicles.